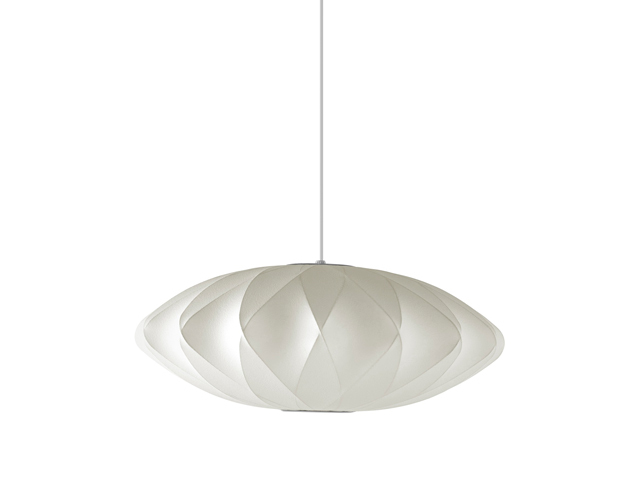 The Nelson Saucer Criss-Cross Bubble Pendant is part of the Nelson Bubble Lamp series. Inspired by a set of silk-covered Swedish hanging lamps, George Nelson designed the series in 1952. Beyond the soft light this lamp casts, it features a unique criss-cross pattern that adds an interesting contour to the shade. A classic George Nelson design, the Nelson Saucer Criss-Cross Bubble Pendant has a bisecting pattern in its under-structure, which gives the lampshade a lovely contour. This pendant light comes with a 6-foot-long cord that allows it to be attached to a brushed nickel-plated steel ceiling plate, and delicately hover overhead. Nelson first designed the Bubble Lamps in 1952, when he came across a set of Swedish hanging lamps that he admired. Their expensive price prompted Nelson to design his own. The result was a series of elemental, spherical shapes including a rounded apple, a wide saucer, an elongated cigar, and a shapely pear. For use with up to 13 CFL watt bulb. Light bulb not included. For use with up to 32 CFL watt bulb. Light bulb not included.